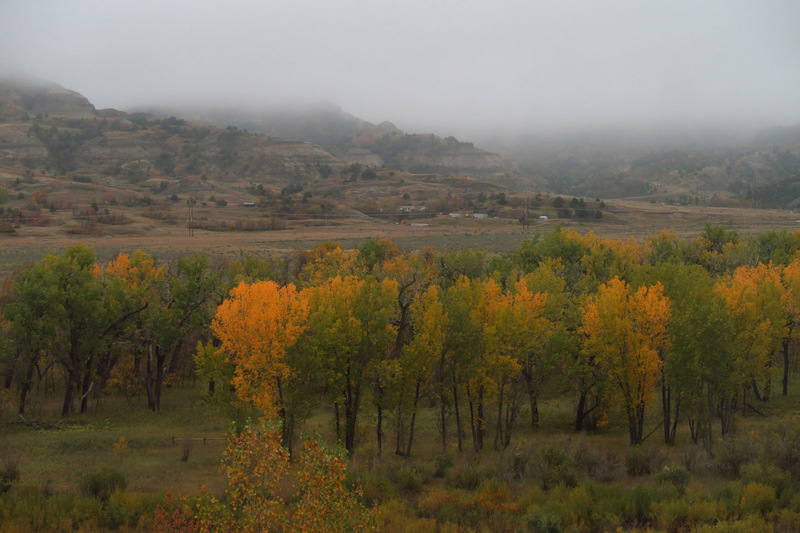 TRNP North Unit — Don’t Skip It! So when pondering the words of advice regarding the North Unit of Theodore Roosevelt National Park from the Rasta-man working construction in the South Unit to “Skip it!” on the premise that I had “seen the best of it,” I ask myself, what self-respecting National Park junkie would drive all this way just to see a national park, and only see half of it? Although I have been accused of passport stamp collecting plenty of times in the past, that couldn’t be further from the truth. I am not a “drive by” park visitor. I like to spend time in the parks probing and penetrating, discovering just what it is that gives them this highly esteemed status of “Park” within the National Park System (not Monument, Seashore, or Historic Site, but one of only 59 sights bearing the title name “Park.”) The North Unit has something to show for itself, so no way am I going to skip it! So I venture forth on the 70 mile two-lane of Highway 85 further north. It’s getting late in the year to be just 200 miles from the Canadian border, so it always makes me a bit apprehensive to keep driving further north. This highway is a main artery down through North Dakota with few areas to pull over, so pity the poor slow-poke like me who gets in front of an 18-wheeler. They appear to eat RVs like mine for fuel. I feel like a fast food wrapper wadded up and tossed out the window as they fly by me. 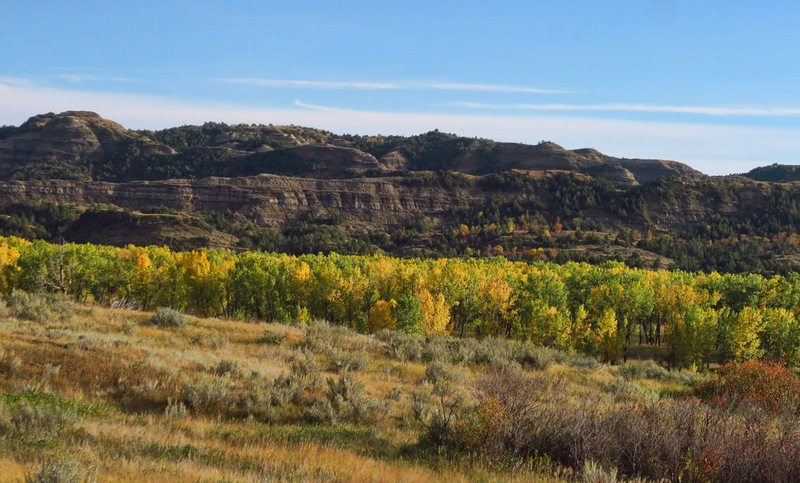 Golden Cottonwoods are in abundance along the Little Missouri River. Note large, round rocks protruding from the butte. These “cannonballs” formed within sediment layers. Some have completely eroded out, while others are only half exposed. You know you have reached a remote outpost in the NPS when the Visitor Center is in a temporary mobile building, and the kiosk is little more than a yellow flashing light. So it doesn’t take long for me to realize what is so special about the North Unit. There is nobody here! 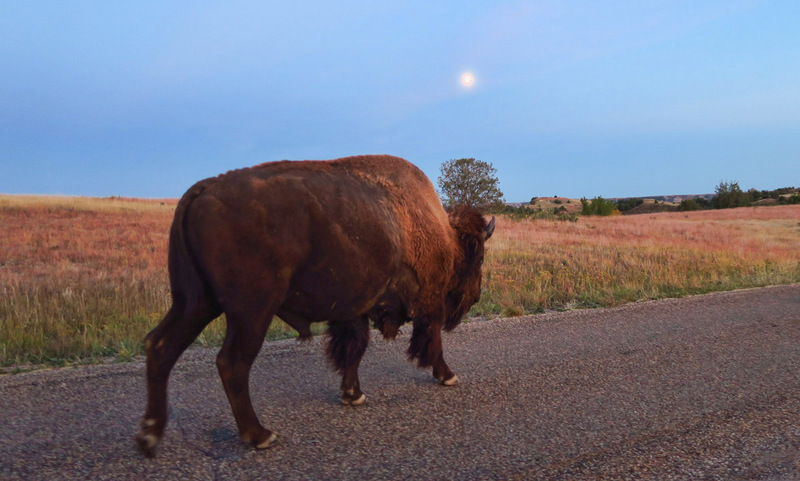 I didn’t know it was still possible to visit a place that had more bison than people. It’s love at first sight. 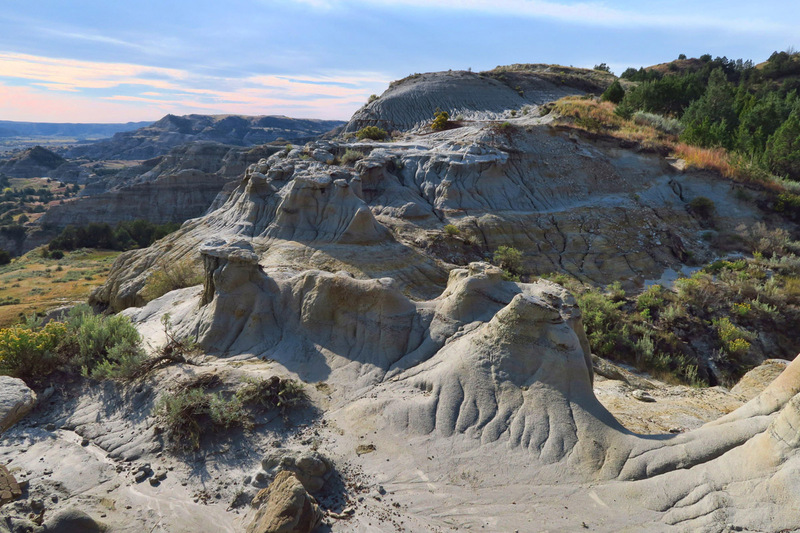 Whereas the South Unit is more rolling badlands and mounds of striated sandstone, the North Unit has more of a “canyon” feel to it…as if South Dakota’s Badlands and the Grand Canyon hooked up and sprouted an offspring. 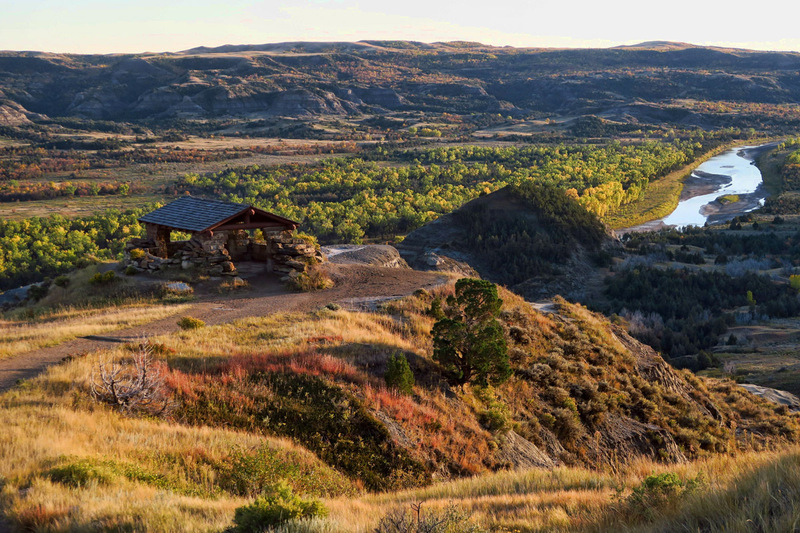 Vast overlooks, deep gullies, and bison traffic jams galore. 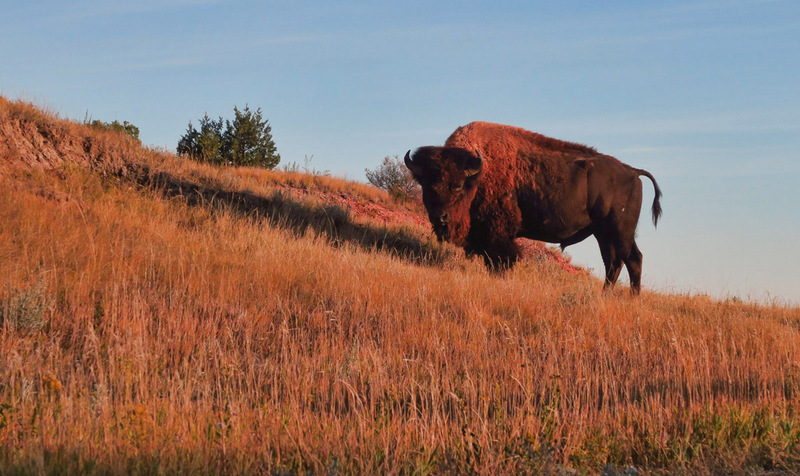 The bison in TRNP’s North Unit seem less evasive than other parks, like they know they are the majority. This is yet another park where the CCC have hand prints in the concrete. With limited machinery, they surfaced the Scenic Road including stone culverts, the CG picnic shelter, and the River Bend Overlook seein in this photo. It’s particularly lovely during the waxing moon. Unlike the Cottonwood Campground in the South Unit that is on the NPS reservation system, the little Juniper Campground in the North Unit is completely first come first serve. So I am a little apprehensive about not having a “Plan B” if it’s full. After all, the South Unit campground had filled up on the weekend while I was there, and it’s a Friday night when I arrive in the North Unit. However, I needn’t have worried, as the campground was no more than 25% occupancy. 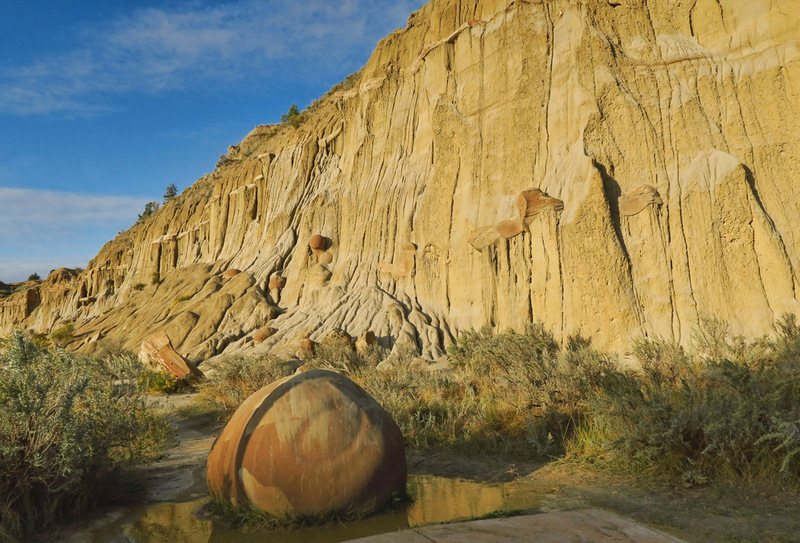 When’s the last time you had your pick from 30 campsites inside a national park? 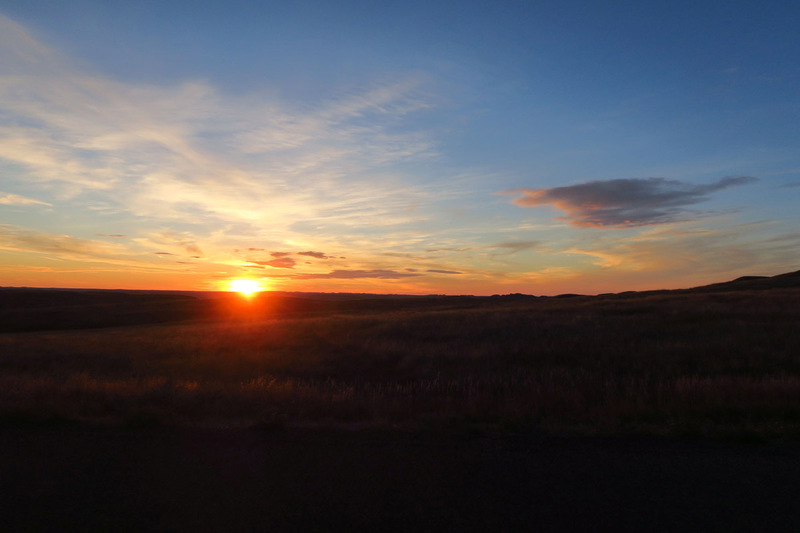 Beautiful sunsets across the prairie. It’s almost surreal being in the midst of them with no one else around. And, Oh! The hiking! There are a lot more hiking trails in the North Unit than in the South Unit, and each one loaded with features and views. They are also longer trails. 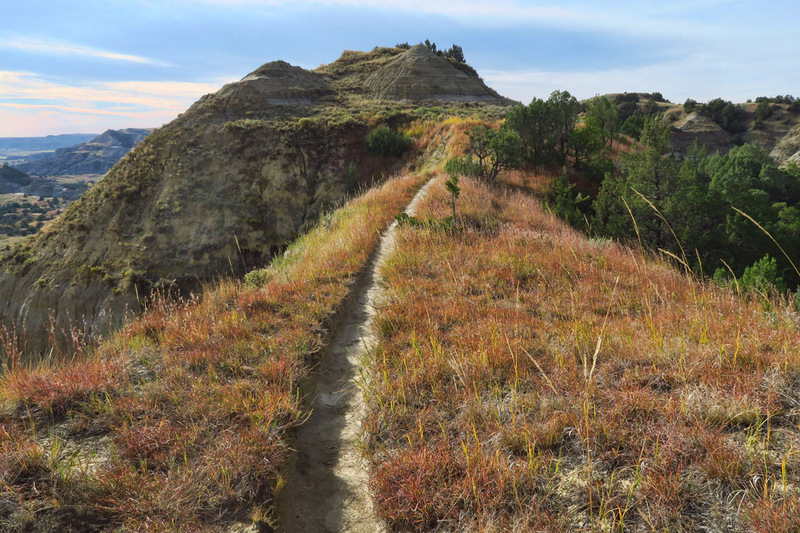 Whereas the South Unit offers short 1 mile trails from the overlooks and one long trail that requires fording the Little Mo River, the North Unit has some great hikes in the 5 mile range, my sweet spot. 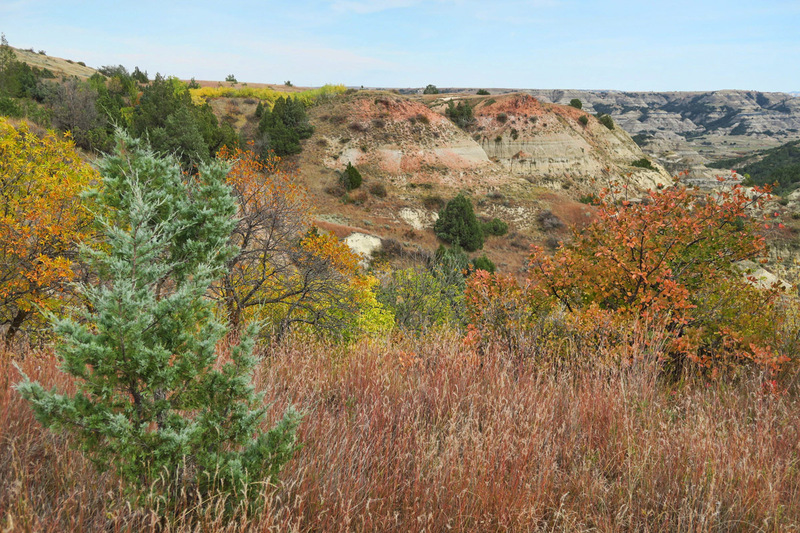 The Caprock Coulee Loop actually starts out along the shorter Caprock Coulee Nature Trail. 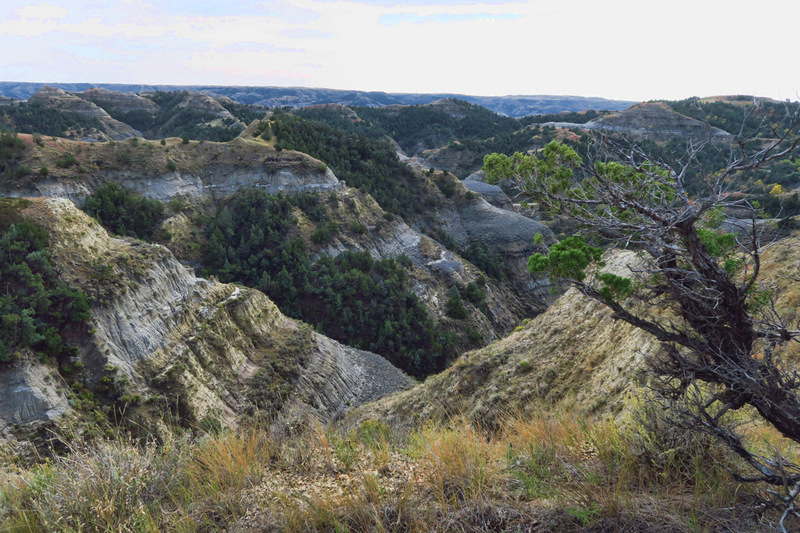 The Caprock Coulee Trail climbs up to the rim with beautiful overlooks. There are some very skinny ridge lines along this trail. This one plunges down across a narrow saddle, then back up. 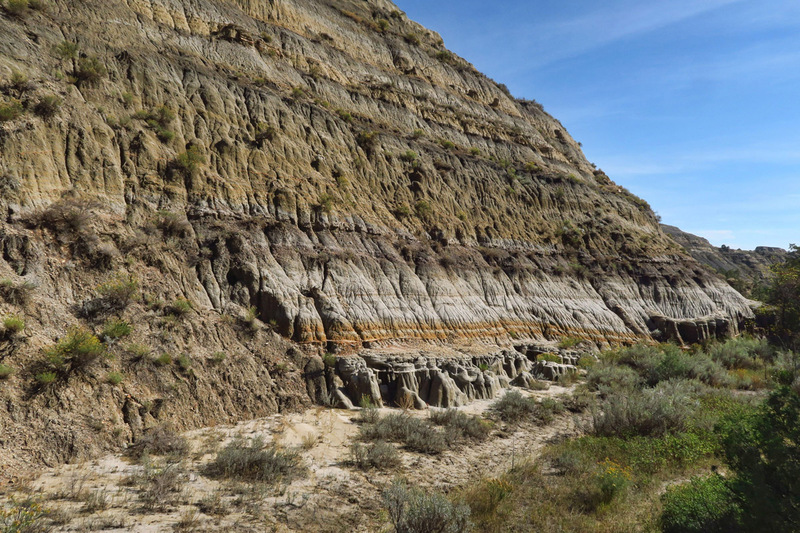 Beautiful fall colors in the foliage match the pastels in the sedimentary layers. By far my favorite hike was the Caprock Coulee Loop hike. At only 4.5 miles, it seems much more expansive because the scenery changes every half mile from ridge to rim. 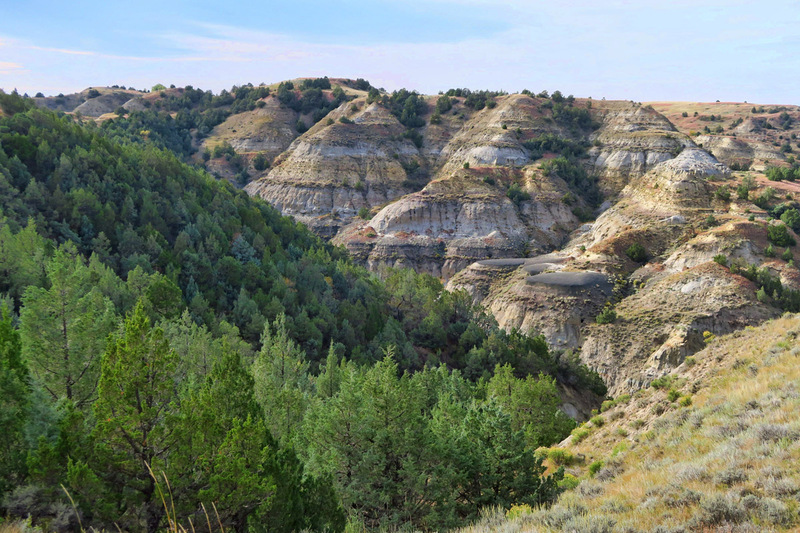 It starts out in a juniper forest, wanders through a layered canyon, climbs up to a ridge with vistas looking out across the Little Mo River, travels several extremely skinny ridgelines narrow enough to quicken the pulse, and then drops back down into the fragrant junipers. By the time I was done, it felt like I had walked through a microcosm of the South and North Units combined. 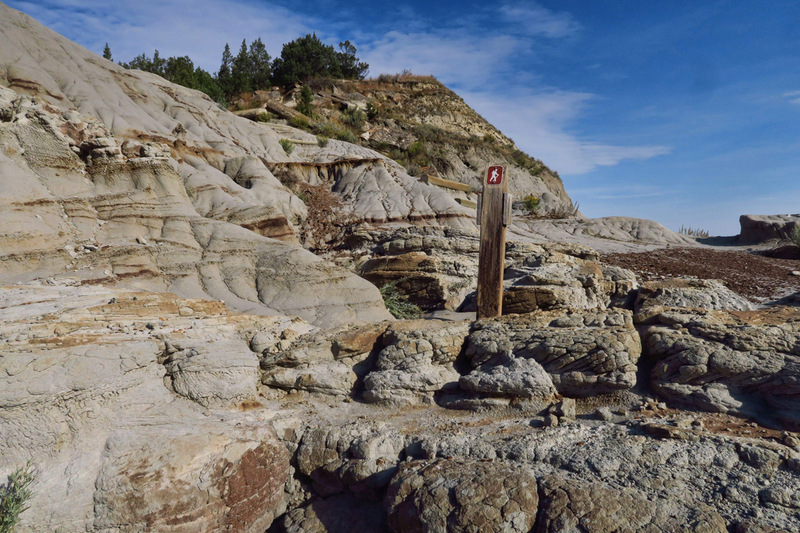 Trail goes through some interesting formations. 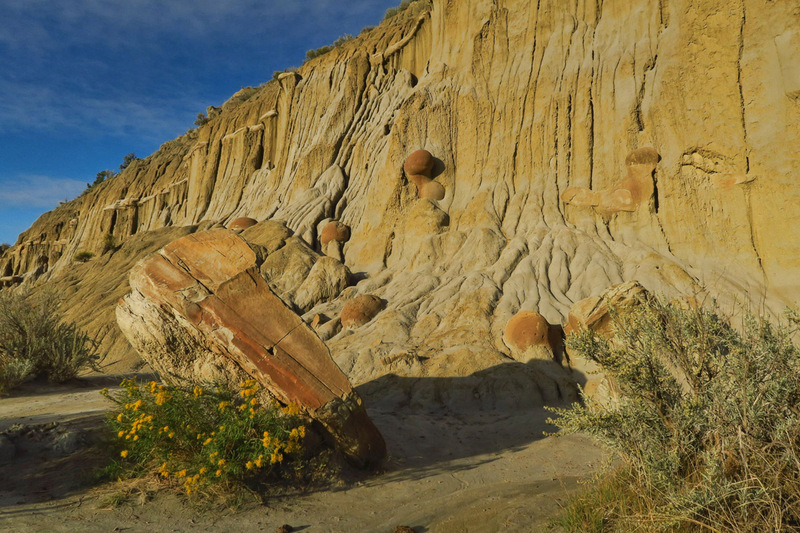 The bentonite clay here was dry, being in direct sunlight. I found climbing through this stuff to be scarier than the skinny ridge lines. Less stable. One of the more bizarre sections of the loop trail. Big old petrified log right along the trail. 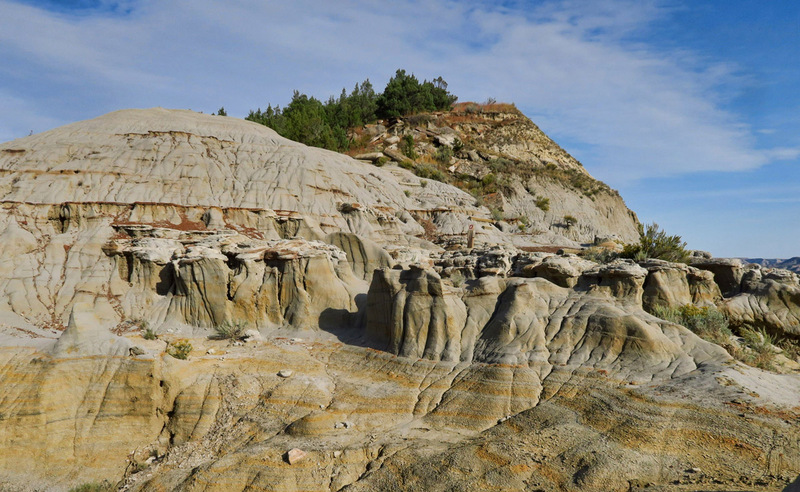 But if you do any hiking in this area, beware of the bentonite clay! Particularly after it has rained. There is lots of it in both parks. This volcanic ash sediment absorbs water so effectively, up to five times its weight that it’s used in the making of kitty litter. Though it can appear dry and cracked on the surface like gray popcorn, it’s slippery and slimy as snot below, and takes forever to dry out. Since the surface appears to be dry, you don’t know you’re in trouble until you’ve stepped in it, and then it’s too late. Limbs and hiking poles start to splay like a giraffe on ice skates, and the harder one fights it, the worse it gets. 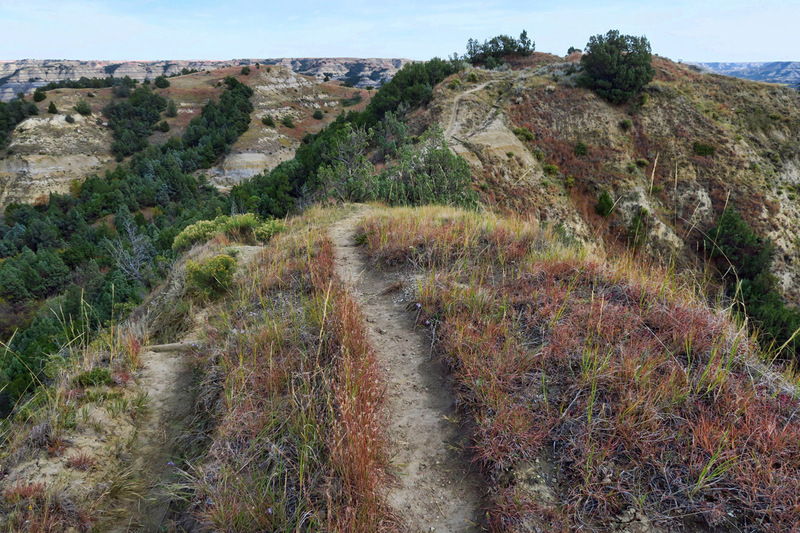 This trail follows the rim overlooking the Little Missouri River. I love hiking ridge lines, which is why I loved this hike so much. Heading around the loop, back toward the juniper forest. One last narrow passage before the trail heads down. 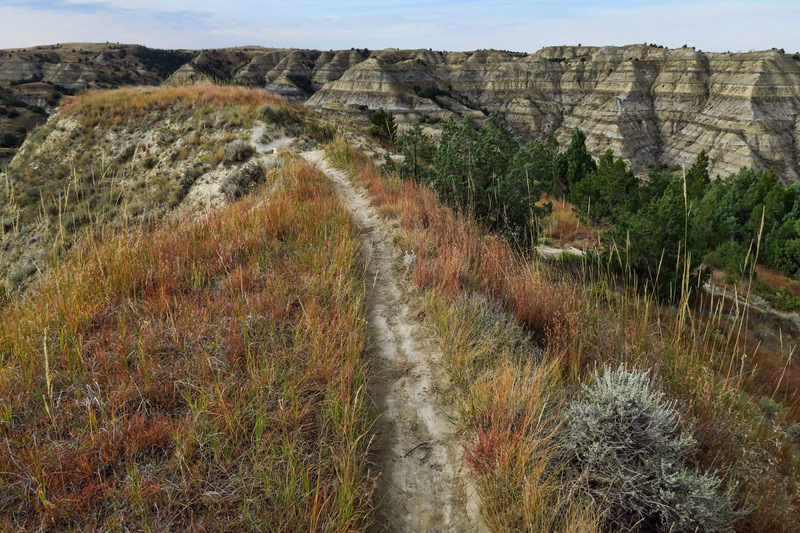 Trail skirts around back into the badlands. Beware of the bentonite! 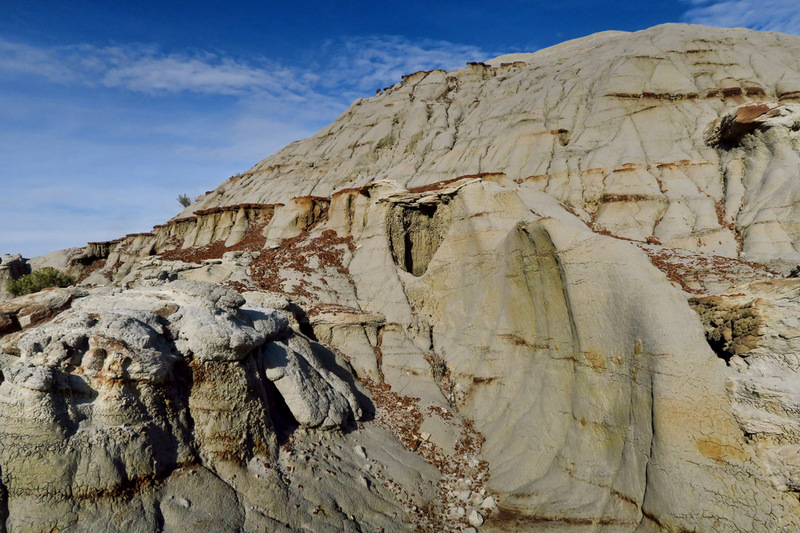 I encountered a hillside slope of bentonite clay on the last quarter of the loop hike the day after a rain. I had two choices — backtrack the 3.5 miles I had already hiked, or find a way to cross it. 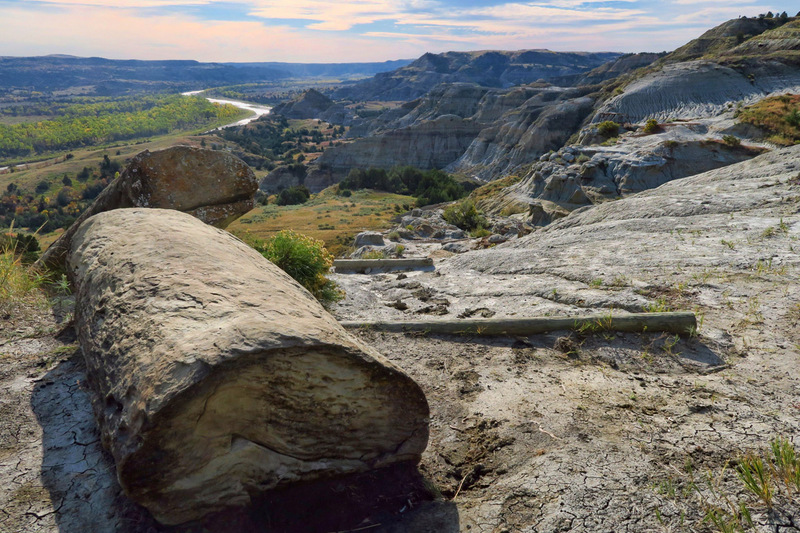 Suffice it to say, I now have a long-lasting souvenir from Theodore Roosevelt National Park’s North Unit permanently embedded in the seams and woven fabric of my breathable boots and every crack and crevice of my hiking pole. But I wouldn’t have skipped it for the world! It was with great melancholy that I left this wonderland behind on a foggy fall morning. 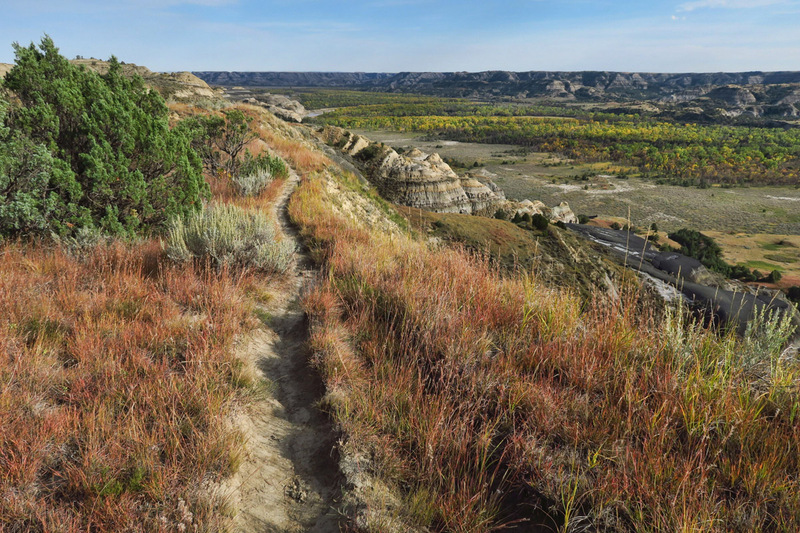 This entry was posted in National Parks, North Dakota and tagged Caprock Coulee Loop, North Unit, Theodore Roosevelt National Park by Suzanne. Bookmark the permalink. Now that’s my kind of National Park…or park in general! Good trails, free of people. Reading your last post we were sure you skipped the North Unit and headed south. So glad to see that you didn’t and gave us a peak at what that area looks like. We only did the South Unit when we were there last time, now it is time to make plans for a northern visit! I knew you wouldn’t let us down…the North rules! Wow, so glad that you persevered and went North! 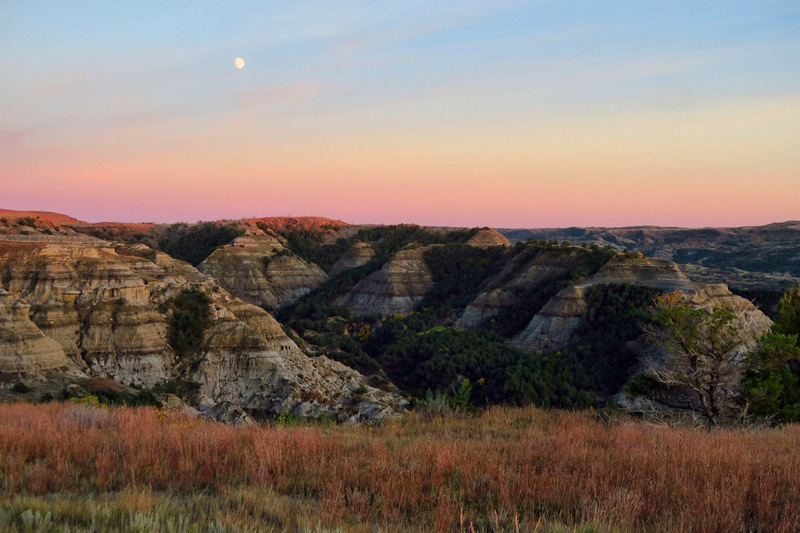 The Dakotas are both back on the bucket list. 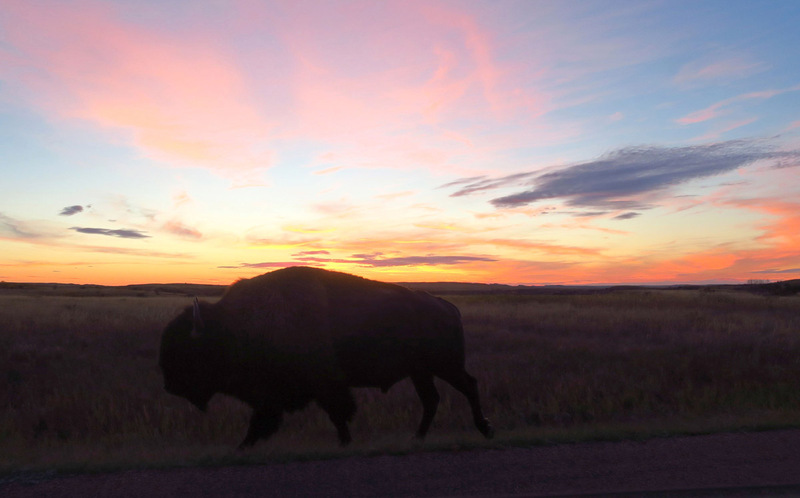 I am totally entranced by the number and closeness of the bison. Thanks once again. Curious – any sign of Theodore Roosevelt in the North unit? Also, the cottonwoods here in central New Mexico are much farther along than the ones you photographed. I wouldn’t have expected that. Hi, Creigh. I did not see any mention of TR in the North Unit, however in fairness, I did not stop at the Visitor Center since I had been to the VC in the South Unit. Ok, that does it. I am not going anywhere unless I’ve checked your blog to see if you have been there first so I can make sure I do National Park Right. I listened to Rasta-guy and did not go to the North Unit when I was there. I recommend 2 books about Teddy Roosevelt. And, they are both by David McCullough: Mornings on Horseback and The Path Between the Seas. We have the audiobooks. David McCullough brings history to life and I felt that I was grieving right along with Teddy when both his wife and his mother died. I actually shed some tears. Thanks to you and David, I can’t wait to visit the National Park named for him. My dear cousin…how you make me laugh! Surely two “bird nuts” in the family is enough, no? I know all I need to know about birds…there are brown ones, black ones, blue ones, white ones, and red ones. At least I don’t call them “sea gulls” anymore! That’s a step in the right direction, right? haha!! 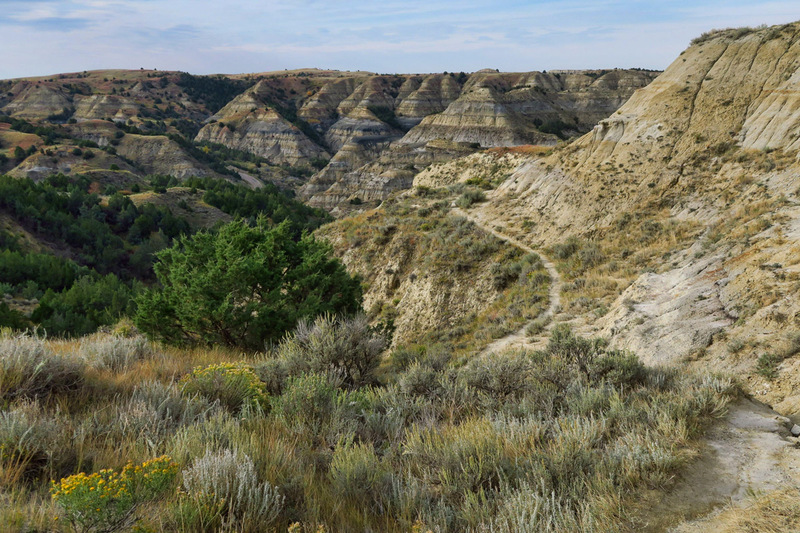 If we ever do make it to TRNP we’ll be sure to check out the North Unit., too. 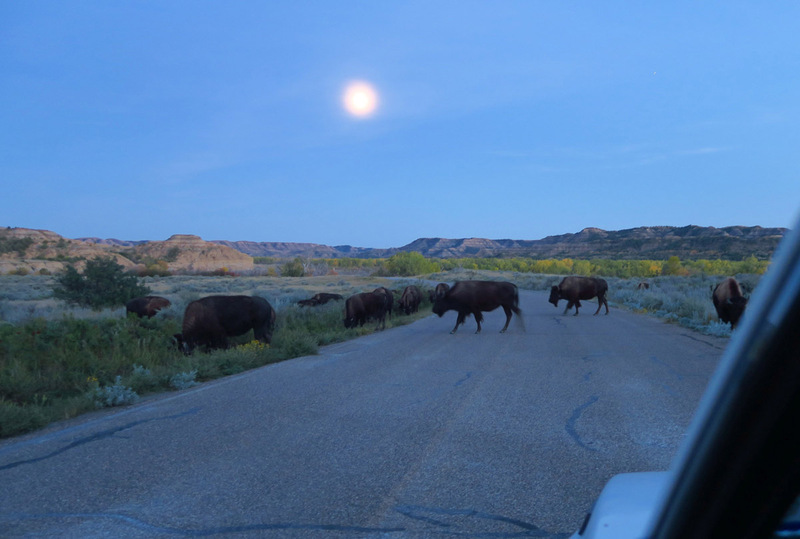 I felt transported to the magical feeling of being among the bison in the moonlight. Thank you for that!